The SPX closed above 1325 yesterday thus I thought we'd see new highs today. Pre-market it actually looked like that (the high was ES 1336.5 = SPX 1338), bears stepped in around the European open though and the market has been selling off since then. 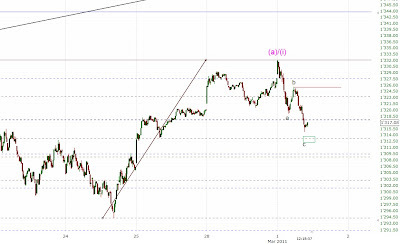 My preferred target for this sell off is the 1313 area. There we got the 50 % retracement and wave a equals c. If we decline even further the next stop is the open gap at 1307.